DIY Days is a roving gathering focused on turning inspiration into action. Each event is themed around the accessibility of ideas, resources and networking that can help to improve the planet. 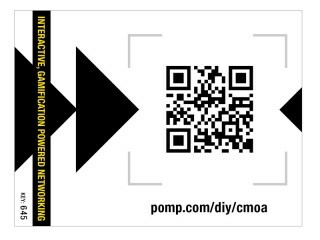 In late 2011 Pomp Productions was asked to create an installation and interactive experience for the DIY Days UCLA event at the Charles E. Young Research Library. The theme for the event was networking, marketing and fundraising. With social media, QR codes and gamification being hot topics in advertising, we set out to create a social experiment which combined both to gauge their effectiveness – We designed and developed an experience to promote social interaction through technology. 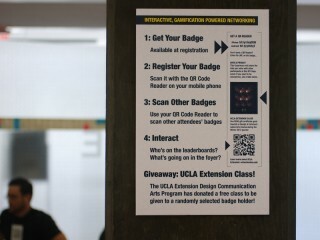 A $500 UCLA Extension Course giveaway provided additional incentive to promote game play. 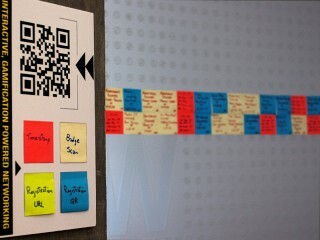 The installation consisted of a real-time, physical “data center” staffed by workers, hired through Task Rabbit, who provided attendees with QR coded game badges and instructions. 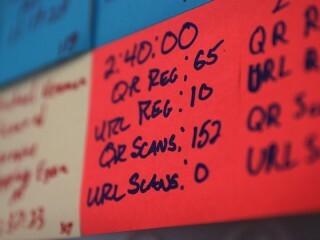 Workers monitored real-time game data feeds and transcribed each event onto color-coded sticky notes. 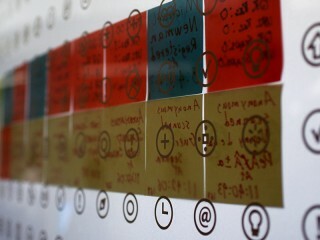 The handwritten events were placed in chronological order in a rotunda at the entrance of the library creating a large-format data visualization. Game statistics were generated at ten minute intervals to provide visual indicators of the pace at which data was captured. Each event attendee received a game badge with a unique QR code. With their smartphone, attendees scanned their badge for access to a mobile App connecting them to the game through the Facebook API. 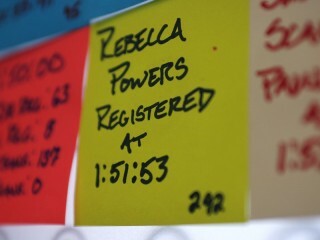 Attendees were prompted to enter a fact about themselves which was shared with other attendees as the game was played. Game play centered around networking – Attendees received points each time their badge was scanned by another player and every time they scanned another player’s badge. 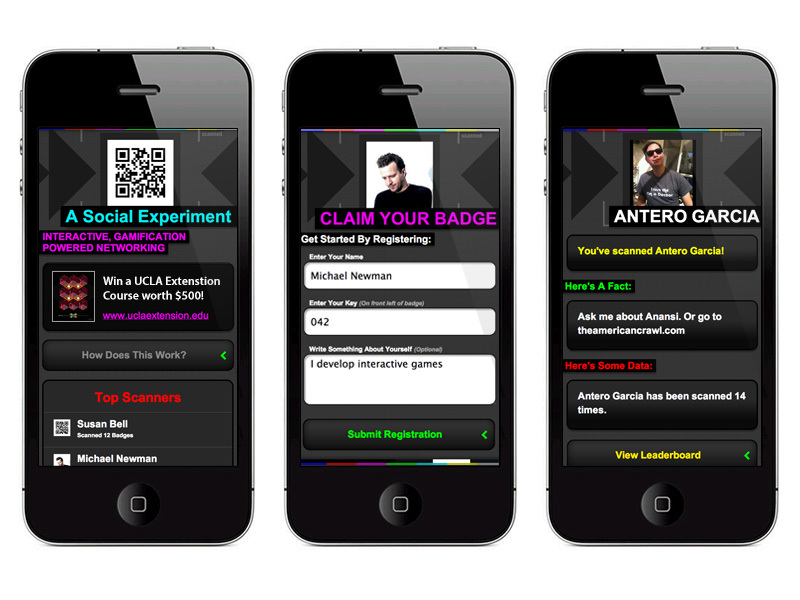 Upon scanning, the App displayed information, photos and data associated with the badge wearer to help promote conversation and social interaction. The App also provided real-time leaderboards with categories for the most scans received and the players who scanned the most badges. At the conclusion of the event Pomp Productions’ Michael Newman gave a talk on Gamification and Social Media. 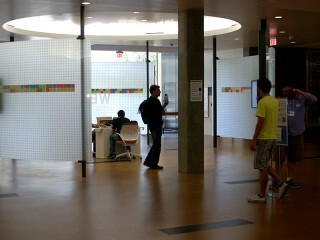 The talk included interactive marketing concepts, social media integration, and a high-level overview of App technology. Game data collected through the App was presented and discussed to illustrate the underlying game mechanics and analytics. The talk also included strategies for integrating technology for fundraising and promotions.